Carrot Cake Recipe Archives - THE OLIVE BLOGGER - Recipes your family will love! With only a couple of weeks to go until Easter I thought I would share another SUPER EASY dessert recipe that anyone can make! This delicious Carrot Cake Trifle uses a boxed cake mix and homemade Cream Cheese Frosting and comes together in no time. I even added in some candied walnuts to give it a nice crunchy texture between the layers! There is something about Carrot Cake and Easter…I mean, maybe it is just our home, but they really do go hand-in-hand. The cake has a very subtle spice to it which is complimented by the thick, creamy frosting (which is great for cupcakes too)! 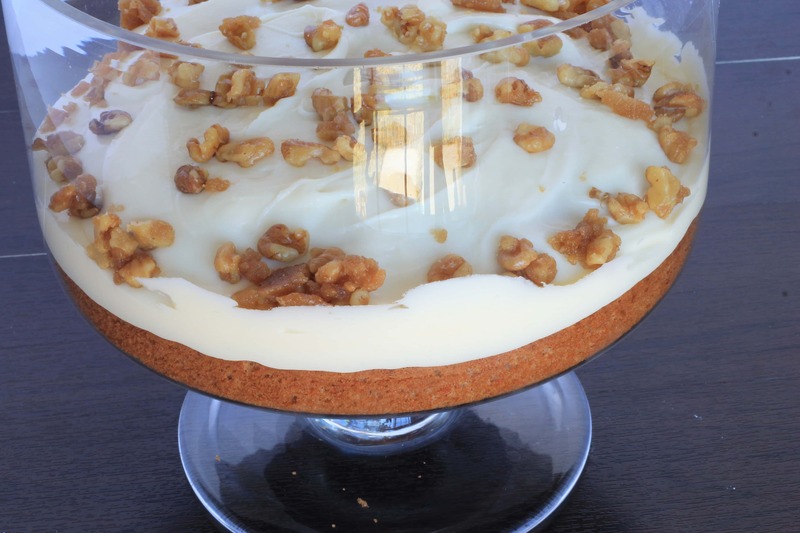 This easy Carrot Cake Trifle is layered with a delicious Cream Cheese Frosting and Candied Walnuts, making it the perfect dessert for you Easter celebrations! I chose to do mine by cooking the cake in two 10″ cake pans (just based on the size of my trifle dish) but you can cook it as a rectangular cake and crumble the pieces if you prefer! Either way, this is one deeeelicious dessert. I even thought about doing it as individual servings in martini glasses instead, and actually might end up doing it this way for Easter dinner…I think it would be cute to give each guest their own “mini trifle” to dig into! You can see in the picture here how I did the layers. Be sure to get your icing all the way to the edge and press some of your candied nuts there too so they show when you get the next piece on! Cake - 1/2 of the icing - 1/2 c walnuts and repeat. If you have any extra cake (I cut the tops of the cake to make it flat for layering) you can crumble on top like I did! Don’t forget your Candied Walnuts – Get the recipe HERE.